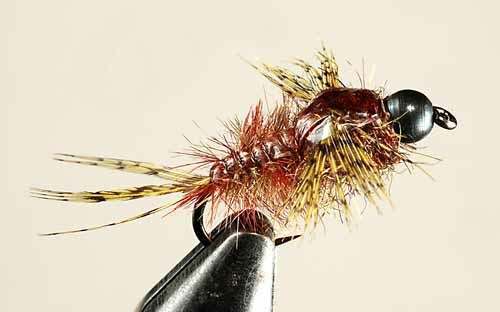 ...deadly, convincing, and highly effective at fooling wary trout, here are Skip's most popular nymphs for rivers, streams, and lakes. They are ready to take orders, so we've added a link to this page (and to the individual fly descriptions themselves) so that you can go straight to their site and order Skip Morris Nymphs directly. 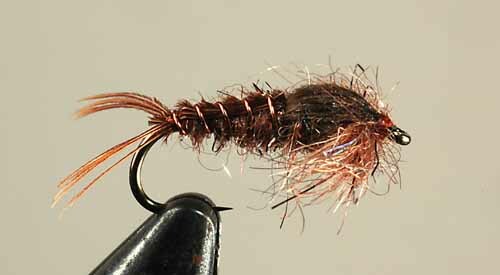 and are tied commercially by Solitude Fly Company. 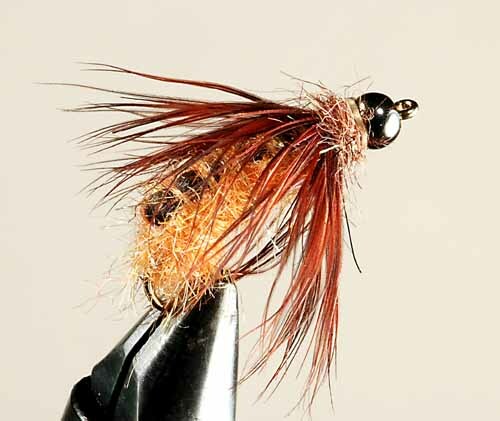 The debate over realistic fly designs versus rough, impressionistic ones continues decade after decade. Suppose, though, you have a semi-realistic nymph design not rigid like so many such flies but instead with soft, lively legs and tails and gills... then you have the Anatomical Nymphs. This fly imitates the nymphs of those ultra-important tiny mayflies (Baetis or Blue-Winged Olive) of spring, winter, and fall. A common mayfly on both coasts of North America and all those rivers in between. 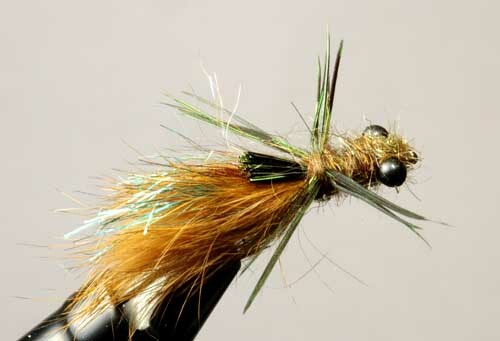 This fly imitates the nymph of the most widespread of all lake mayflies. Before and sometimes during the hatch (depending on the trout's mood), it can be just right. This fly imitates the nymph of the big green drake mayfly of western rivers. 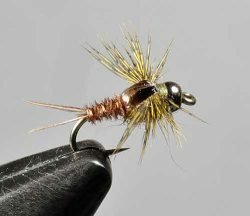 It can be a wonderful hatch to fish, with big trout moving to the big insects, and just before the hatch and sometimes during it, this can be the fly to have. 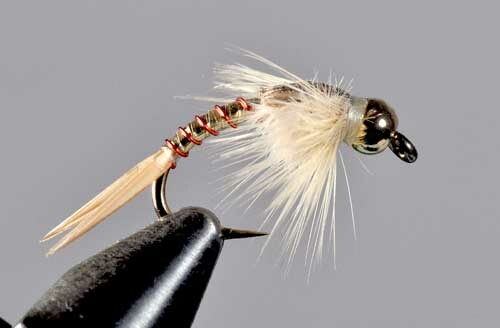 This fly imitates the nymph of the pale morning dun mayfly, the staple of western mayflies of the regular season. A common insect found in rivers and streams. 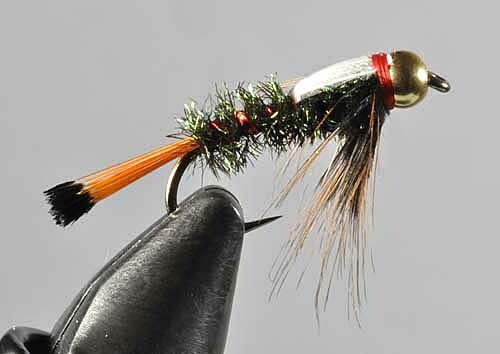 The Skip Nymph is among the first flies many beginning fly tiers tie, thanks to the popularity of Skip's longtime best-selling book Fly Tying made Clear and Simple— and it's proven itself over the past two decades as a rock-solid imitation of mayfly nymphs and small stonefly nymphs, and a fine all-around searching nymph. It's been featured in many books and magazine articles. 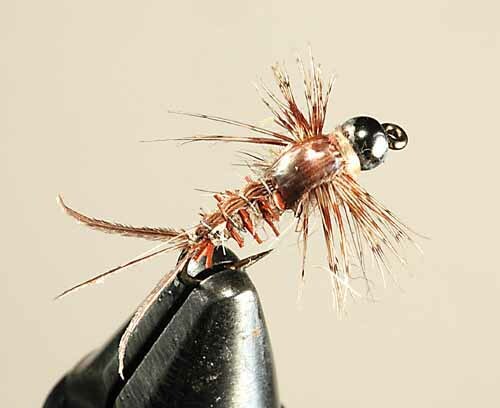 A dark bead blended into the thorax of the Ultimate Skip Nymph really pulls the fly down, and a touch of sparkle gets it noticed down there among the trout. The October caddis is the biggest caddis on western rivers, and appears in late September into early November when not much else is hatching to compete with it— this can be one critical caddis. 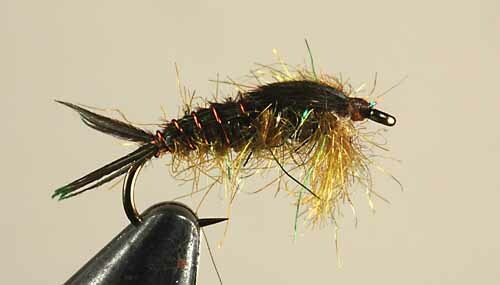 Skip's Brick Back October Caddis imitates the important pupa stage. Fished dead-drift below a strike indicator to imitate failed pupa or pupa drifting as they regain their motion after so long in a shell, or cast upstream to sink and then swung towards the bank like a swimming pupa, the Brick Back can move lots of trout on a good day, some big ones among them. In spring and fall, water boatmen and backswimmers (which look and act and are the same as far as trout are concerned) fly out in swarms to nosedive into lakes and drive trout wild. Have a few Morris Boatmen on hand so you can get in on the action when it comes. Dragonfly nymphs are often the biggest insects in a trout lake and, unlike reclusive mayfly nymphs and chironomid larvae, are regularly out on their own hunting trips exposing themselves to trout. So, since trout in lakes are used to watching for dragonfly nymphs, Skip trusts his Sparkle Furry Dragon to produce almost any time there's no other hatch going on to distract the trout. An excellent choice for fishing over shoals or just trolling. 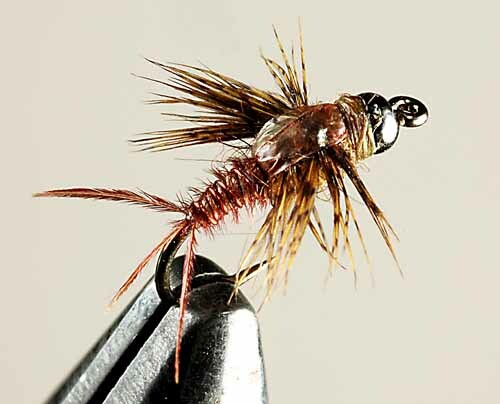 There should always be attractor nymphs in every fly fisher's boxes—and the Dazzler is among the deadliest attractor nymphs around. Shining ribs neatly segment a gleaming metallic body. A thorax of soft fur blended with sparkling strands undulates with a river's currents. A pale, supple hackle waves in the water. 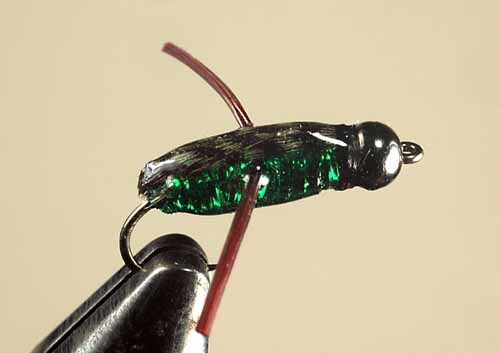 An ultra-heavy tungsten bead draws the whole fly down to waiting trout and gleams to catch trout's attention. simply attracts and catches trout. proving themselves on trout lakes too. 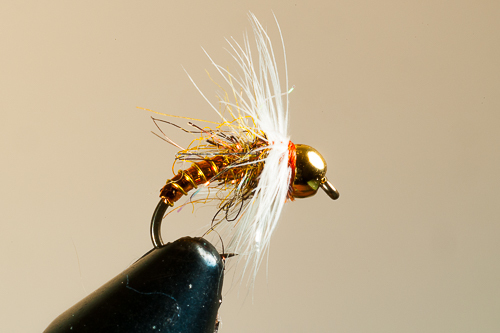 Here's a very bright and fast-sinking attractor nymph that sometimes just cleans up on trout in rivers. 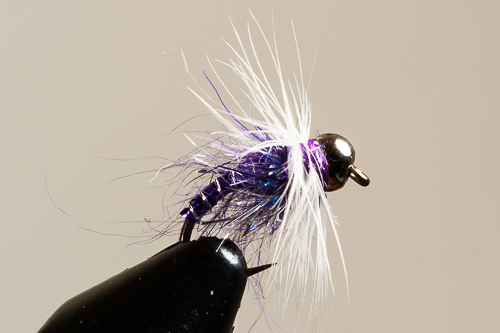 It can be a hot fly on trout lakes too, when nothing else seems to work. Some surprisingly finicky, difficult trout have taken the Trumpet. Gold is the reliable standard. 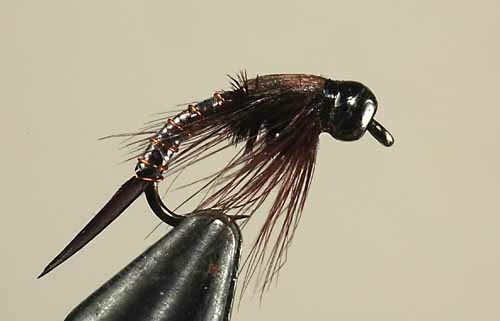 The Gabriel's Trumpet, Black can be more than an attractor nymph, imitating dark mayfly and small stonefly nymphs. beloved—and trusted— Royal Coachman dry fly. far out-fish imitative flies sometimes.